This week consisted of saying goodbye to friends that are moving out of state, sending my girl off on a trip with her grandmother for a week, record-breaking heat here in Austin (110 degrees!) and hanging out with my little guy and fulfilling his every wish while his big sister is away. I also finished decorating/styling my front porch for summer, finally, and since summer will last until November-ish here, it should be good for a while. I'm excited to enjoy a kid-free weekend reading and relaxing before things getting back to normal on Monday! How about YOU? The picture above makes me feel so happy and, in my opinion, was worth all of the effort. 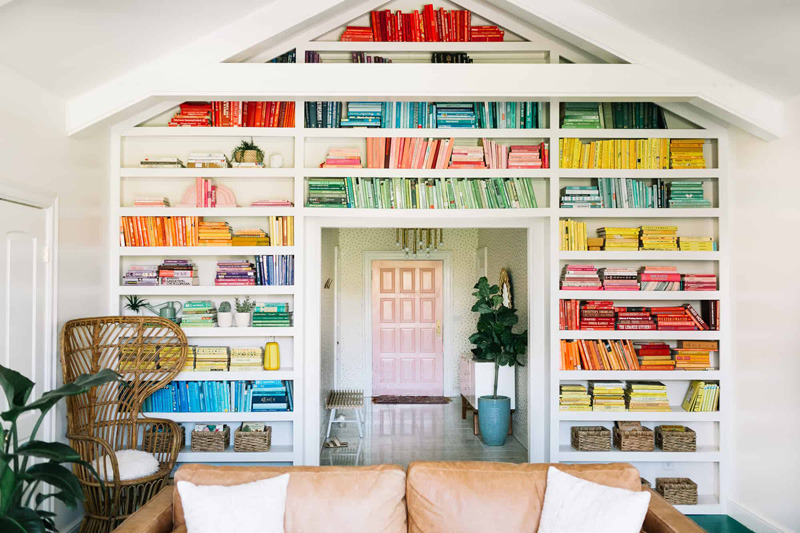 For me, it doesn't get any better than this because I love books and I love color! When you think of color and fashion, it's hard not to think of Betsey Johnson. She opened up her home to People and you can see the pictures here. It is exactly what you'd expect and just so much fun. If you're like me and fascinated by the tiny house movement, you'll love these Instagram accounts that give you a glimpse into the lifestyle. They're all so lovely! New summertime plant trends. Enough said. This pink marble lounge in Ghent, Belgium is incredible. I can't imagine how it would feel to be in this space, probably a bit out of place, but in awe. I'm a sucker for a cute dog. Just ask my husband who found that out (just kidding, he already knew) after bringing home a new pup last month. But really, you should check out the chic apartment, too! We'll be leaving for our family vacation next month and I think this is so important. I know it's not home/design related, but I thought it was worth a share if you're traveling as well.